​​For the creative bride who wants to design and assemble their own expression for their Best Day Ever. Come to this course and immerse yourself in a flowery extravaganza. Even if you just want to learn the how-to's of floral event work, this is for you. Inside our newly built flower studio, Liz will discuss and demonstrate how to craft handtied bouquets, boutonnieres and table centerpieces. With Liz’s guidance, students will make all types of floral arrangements to take home. 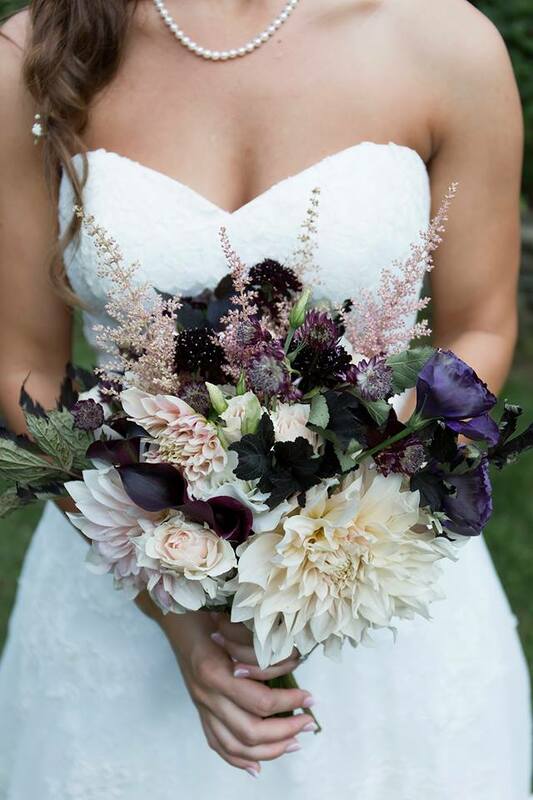 Liz will teach you the fundamentals of color schemes and flower types suited to making your wedding floral display absolutely fabulous. She will cover many details, to include flower and supporting material acquisitions, the conditioning of your flower stems and the transport and storage of your flower creations. Advice about the staging and timing of your floral presentation on your wedding day will also be given. You will be supplied with "insider lists" of locally grown fresh cut flower growers, trustworthy internet flower suppliers and other purveyors of craft materials. These leads will set you on your path to florist quality creations. Flowers to be used in student arrangements will have already been picked and conditioned ahead of time. They will be waiting in overflowing buckets for arrangement assembly. Most of the flowers will have been grown at Maple Flower Farm. However, we want you to have many options to pick from so specialty and out-of-season flowers will come from a wholesale floral supply house. You will be served a lovely seasonal lunch, with refreshments and snacks available throughout the day. Please bring your own flower clippers (or borrow a pair from us). ​Please contact us for workshop availability. Workshop fees are not refundable. There is extensive planning and a limited number of spaces. If you cannot attend, please gift your reservation to a friend! Nevertheless, please contact us if you have an issue.